The 2019 Red Hoffman Cup Matches is shaping up to be a milestone year on several fronts. 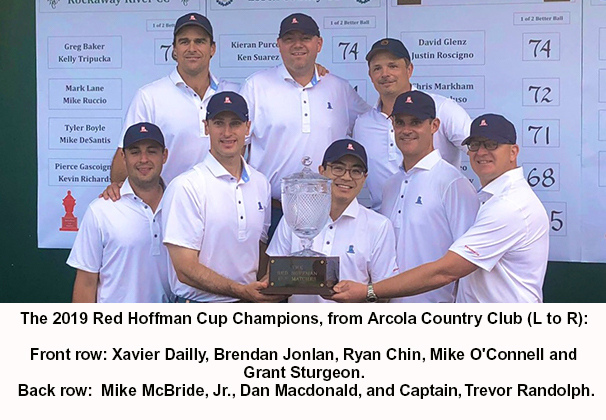 Our 15th year, four new clubs, a great new sponsor, Ridgewood CC as our Finals host and a widely held sense that anything is possible in the Hoffman Cup -- these all point to a special season. We started the Hoffman Cup experiment in 2005, with the wonderful Rock Spring Club and its eleven-time club champ Bill Frese opening doors at Spring Brook CC, Montclair GC and Fairmount CC. This excellent foundation soon led to four more clubs in 2006, four more in 2007, etc., etc. to 2014, when we shut off the spigot at 32 clubs. This year, on our 15th anniversary, we have decided to reopen things up a bit. For the first time in five years, we are honored to include four more clubs -- the Class of 2019 -- to our rotation: Deal Golf and Country Club, Forest Hill Field Club, Liberty National Golf Club and North Jersey Country Club. Now numbering 36, we have an extraordinary cadre of clubs, each with a claim to fame, a commitment to quality and a captain charged with fielding the best team he can. I am pleased to announce the Hoffman Cup's first sponsor, Hudson Sutler. An up-and-coming travel apparel company based in NYC, it has its finger on the pulse of every Hoffman Cup competitor, offering classy weekenders, commuters duffels, garment bags, golf shoe bags and even cool coolers. You'll see more on Hudson Sutler from me in the near future; in the meantime, take a minute to go to their site. You'll see why Hudson Sutler strikes me as our perfect first partner. You have no doubt heard that the USGA recently announced that Ridgewood, the site of our 2019 Finals, has been named as the site of the 2022 US Amateur Championship. Already one of the country's most revered clubs, with USGA, PGA Tour, MGA and NJSGA championships galore, Ridgewood carries on a tradition of giving back to the golf world. We are so honored to be invited to the party! Parity rules in the Hoffman Cup! Do you realize that, of the eight clubs that won their Group in 2018, two (Hollywood GC and Mountain Ridge CC) were seeded fourth in their Group? Similarly, two third seeds, Rumson CC and Manasquan River GC, won their Groups. Did you see that only one group winner, 2018 Finals runner-up Baltusrol GC, features more than 18 holes! 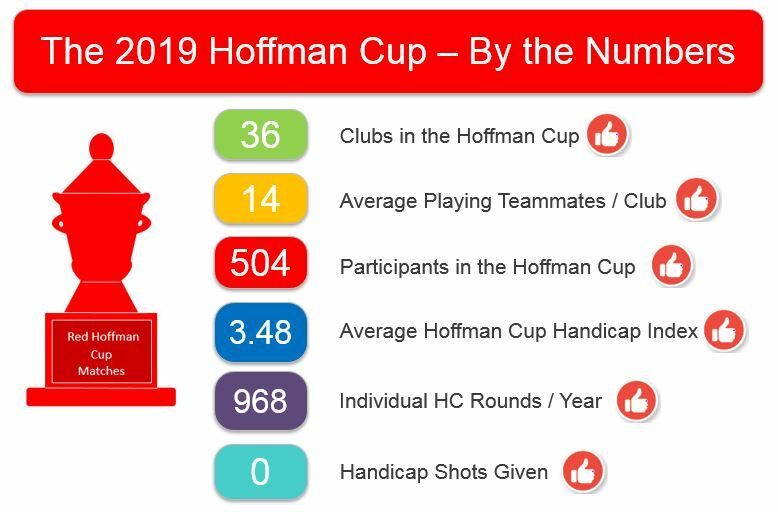 One might expect success in the Hoffman Cup to be a numbers game, i.e., the more members in a club, the more likely the club will finish high in the Hoffman Cup. Well, the truth is that the most important ingredient in a Hoffman Cup team is an engaged, communicative captain. His leadership and attention is paramount. With a strong captain, any one of our clubs can have a great season. 2019 -- it's gonna be a great year! The significant Hoffman Cup dates have been cast in stone, as follows: The 2019 Hoffman Cup Matches will officially start on Saturday, April 27. The second round will be Sunday, April 28, with the third round scheduled for Saturday, May 4. That leaves time before April 27 and on Sunday, May 5 to help deal with potential conflicts. The Semifinals will be played on Saturday, May 11, and the Finals will be played at historic Ridgewood CC on Saturday, June 1st. Your pro shop, golf committee chair and your green superintendent should know these dates.